MACE BAR AND PLATE FRONT MOUNT INTERCOOLER - 600 X 300 X 76 WITH 2.5' OUTLETS. Bar and plate intercoolers offer a higher rate of heat rejection when compared to tube and fin designs; which means the engine will receive cooler charge air resulting in increased power gains and a reduced tendency to detonate. Our hi-flow intercoolers also ensure air travels through the core directly on to your radiator and condenser to retain normal engine operating temperatures even under extreme conditions. Although this is a universal size, it has been carefully selected to maximize cooling capacity on boosted Commodores while still being able to comfortably fit behind the front bar without heavy modification like many other setups available in the market. When it comes to prolonged performance and longevity, you can't go past these aluminum bar and plate intercooler systems. Core size: 600mm X 300mm X 76mm (length X width X thickness). Please remember to check out our other performance products for sale. We are committed to providing the best support for our products. Orders are neither dispatched nor delivered on weekends. Orders outside of Australia may take up to 4 weeks. Here at Mace Engineering, we pride ourselves in delivering quality products and services at competitive prices for most of today's makes and models. Originally focused on design and manufacture of performance upgrades for the Holden V6 and the Ford straight-6, the desire of satisfying a larger market became a priority. We now have an extensive assortment of standard replacement and performance aftermarket components which are supplied to both established workshops and a rapidly growing customer base. Our dedicated team of qualified mechanical and automotive engineers are always ready to answer any technical questions with high-value engineering solutions. With the substantial range of engineering design and SAE spec literature on hand, we can assure you that our problem-solving capabilities are genuine and accurate. A majority of our team also has the first-hand experience in motorsport and vehicle restorations and are more than happy to offer any sort of advice in these areas. Our manufacturing facility is operated by highly skilled technicians with over 30 years of international experience. The niche items we manufacture in-house are made within minimal tolerance and are tested & inspected prior to dispatch. If time allows, we also have the expertise to design and manufacture one-off components for specific builds. Our mission is to deliver world-class customer service experience and endeavour to be at the forefront of the automotive industry. 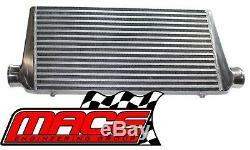 The item "MACE BAR AND PLATE FRONT MOUNT INTERCOOLER 600 X 300 X 76 WITH 2.5 OUTLETS" is in sale since Wednesday, January 31, 2018. This item is in the category "Vehicle Parts & Accessories\Car & Truck Parts\Performance Parts\Turbo Chargers & Parts". The seller is "mace_engineering_group" and is located in Melbourne, VIC. This item can be shipped worldwide.